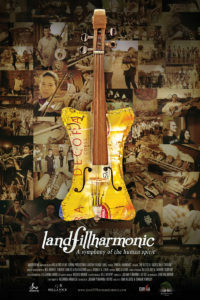 LANDFILL HARMONIC chronicles the incredible journey of Paraguay’s Recycled Orchestra of Cateura. Orchestra Founder Favio Chavez had hopes of sharing music with the children of Cateura, a poverty stricken slum next to the capital’s largest landfill. Since expensive musical instruments were not within attainable for families in Cateura, Favio, along with carpenter and trash picker Nicolas “Cola” Gomez, began to craft instruments from materials found in the landfill to provide children with the opportunity to play. They journey exceeds all expectations as they find themselves playing for audiences around the world, even accompanying artists such as Stevie Wonder, Metallica and Megadeth. They’ve also played for Pope Francis, and recently performed at The United Nations in NYC. Winner of the Audience Award at the South By Southwest Film Festival, AFI DOCS Festival, Vancouver Film Festival; official selection at the Sheffield Film Festival and winner of the Documentary Award for The Humanitas Prize. Co-director Brad Allgood joins us for a conversation on this uplifting and captivating film. This entry was posted in documentary, drama, dramedy, Film School interview, foreign, Indie by admin. Bookmark the permalink.